Have you ever had so many projects you needed to complete that you just froze and didn't do anything for awhile? That's how I have been lately. Instead of sewing I have been reading alot and knitting. I do this to myself every time I take on orders or need to make gifts. Buying "Cherry Fizz" was the motivation I needed to get moving. I won't cut into it until I get the five (yes you read that right) quilts I have to complete in the next seven weeks. Time to get the motor running, literally. First one to tackle is a graduation gift for a sweet friend of my daughter's. This is not a hard quilt and making the flowers is quite addicting. How each flower comes out is a surprise. 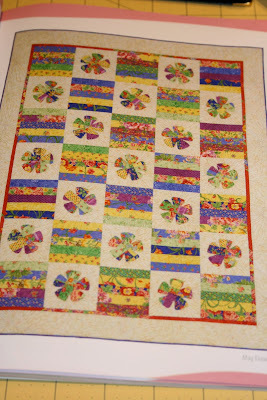 The pattern is called "May Flowers" and comes from the jelly roll book shown below. I used scraps of fabrics that I have made two other quilts with. This quilt is really a stash buster and if you are looking to reduce your stash or scrap basket, this is the one for you! I find that the example quilt has too much cream for me so I will be using a color for the flower blocks and a patterned fabric for the borders. The good thing about this quilt is that I will only have to purchase batting. Yea! I love it when that happens! So pretty! How did you cut those fun flowers? Your daughter's friend will love it. Good for you...using something up you had. That is almost as good a feeling as buying a new collection...not quite. Ha! Beautiful quilt and what a neat idea for the flowers! I love this design. A really nice quilt. The flowers are so pretty. I think I have ordered this book but havent gotten it yet. 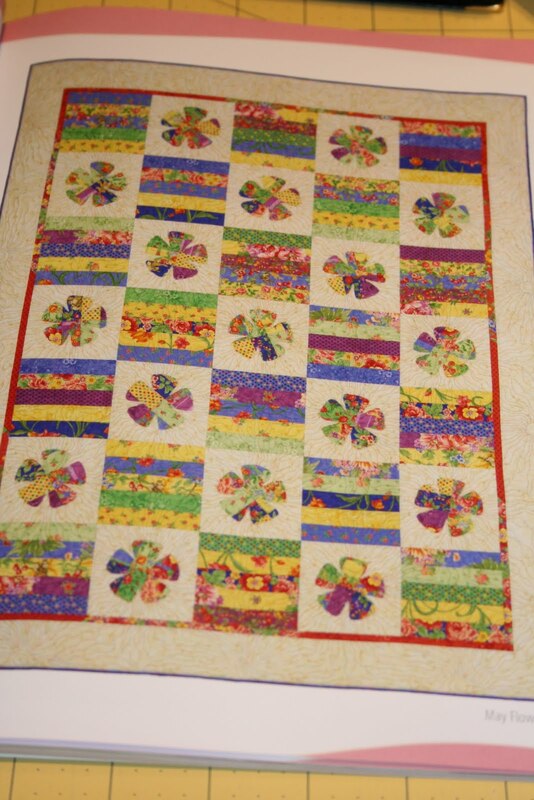 Well, I just love the flower quilt! That is lovely! And yes, I get so many projects going at one time that I feeze and don't know what to do next. It's been like that a bunch lately. I'm still trying to find the bottom of my cutting table. But a baby quilt has to come first before everything else as it needs to be done by May 1...when the shower takes place. Wow, that's a hefty project list of things to-do. I recently put myself in new project time-out while I finished some UFOs. Got them done now I'm free to start some more! Good luck in getting everything finished. This is just awesome and looks so fun! 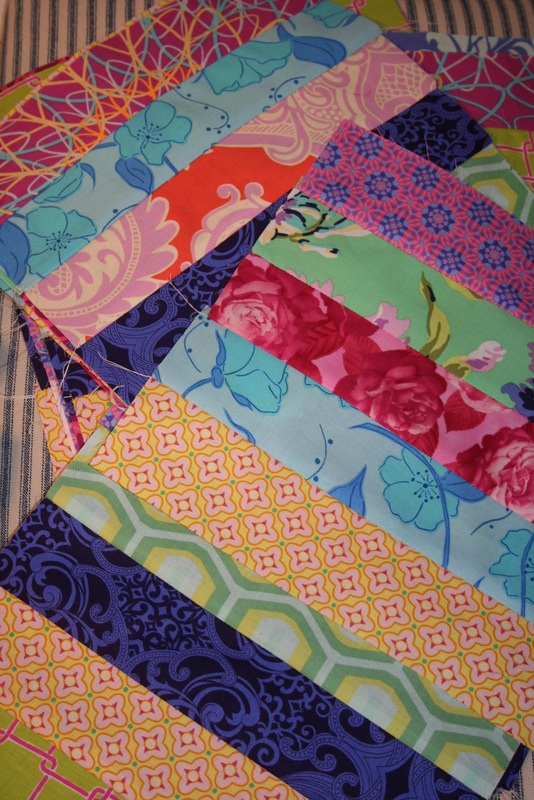 What a pretty quilt that is going to be. Oh, Renee, this quilt is beautiful. I love your alterations for more color!